PC World just ran an article about 5 New Technologies That Will Change Everything that's interesting enough to have a bit excerpted. These technologies are either here already or just around the corner, but it looks like they'll make an impact on our everyday digital lives. USB 3.0 - The 3.0 revision of USB, dubbed SuperSpeed by the folks who control testing and licensing at the USB Implementors Forum (USB-IF), is on track to deliver more than 3.2 gigabits per second (gbps) of actual throughput. That transfer rate will make USB 3.0 five to ten times faster than most other standard desktop peripheral standards. In addition, USB 3.0 can shoot full-speed data in both directions at the same time, an upgrade from 2.0's "half duplex" (one direction at a time) rates. USB 3.0 jacks will accept 1.0 and 2.0 plug ends for backward compatibility, but 3.0 cables will work only with 3.0 jacks. This technology could be a game-changer for device connectivity. A modern desktop computer today may include jacks to accommodate ethernet, USB 2.0, FireWire 400 or 800 (IEEE 1394a or 1394b) or both, DVI or DisplayPort or both, and — on some — eSATA. USB 3.0 could eliminate all of these except ethernet. In their place, a computer may have several USB 3.0 ports, delivering data to monitors, retrieving it from scanners, and exchanging it with hard drives. The improved speed comes at a good time, as much-faster flash memory drives are in the pipeline. USB 3.0 is fast enough to allow uncompressed 1080p video (currently our highest-definition video format) at 60 frames per second, says Jeff Ravencraft, president and chair of the USB-IF. That would enable a camcorder to forgo video compression hardware and patent licensing fees for MPEG-4. The user could either stream video live from a simple camcorder (with no video processing required) or store it on an internal drive for later rapid transfer; neither of these methods is feasible today without heavy compression. Citing 3.0's versatility, some analysts see the standard as a possible complement--or even alternative — to the consumer HDMI connection found on today's Blu-ray players. Video Streaming Over Wi-Fi - Wired ethernet has consistently achieved higher data speeds than Wi-Fi, but wireless standards groups are constantly trying to figure out ways to help Wi-Fi catch up. By 2012, two new protocols — 802.11ac and 802.11ad — should be handling over-the-air data transmission at 1 gbps or faster. As a result, future users can have multiple high-definition video streams and gaming streams active across a house and within a room. Central media servers, Blu-ray players, and other set-top boxes can sit anywhere in the home, streaming content to end devices in any location. For example, an HD video display, plugged in with just a power cord, can stand across the room from a Blu-ray player, satellite receiver, or computer — no need for expensive, unsightly cables. 3-D Television - When television makers introduced HDTVs, it was inevitable that they would figure out a way to render the technology obsolete not long after everyone bought a set. And they have. The next wave in home viewing is 3DTV — a 2-D picture with some stereoscopic depth. As 3D filmmaking and film projection technology have improved, Hollywood has begun building a (still small) library of depth-enhanced movies. The potential to synthesize 2-D movies into 3-D could feed demand, however — the way colorizing technology increased interest in black-and-white films in some circles in the 1980s. For movies based on computer animation — such as Toy Story 3D, a newly rendered version of the first two movies in the series — it's already happening. Augmented Reality In Mobile Devices - Augmented reality is a catchall term for overlaying what we see with computer-generated contextual data or visual substitutions. The point of the technology is to enhance our ability to interact with things around us by providing us with information immediately relevant to those things. At work, you might walk around the office and see the name and department of each person you pass painted on them — along with a graphical indicator showing what tasks you owe them or they owe you. Though many case scenarios involve “heads-up” displays embedded in windshields or inside eyeglasses, the augmented reality we have today exists primarily on the “heads-down” screens of smartphones. Several companies have released programs that overlay position- and context-based data onto a continuous video camera feed. The data comes from various radios and sensors built into modern smartphones, including GPS radios (for identifying position by satellite data), accelerometers (for measuring changes in speed and orientation), and magnetometers (for finding position relative to magnetic north). HTML 5 - Remember when every Website had a badge that read "optimized for Netscape Navigator" or "requires Internet Explorer 4"? In the old days, people made Web pages that worked best with — or only with — certain browsers. To some extent, they still do. The new flavor of the HTML — the standard program for writing Web pages — is called HTML5 (Hypertext Markup Language version 5); and HTML5 aims to put that practice to bed for good. Specifically, HTML5 may do away with the need for audio, video and interactive plug-ins. It will allow designers to create Web sites that work essentially the same on every browser — whether on a desktop, a laptop or a mobile device — and it will give users a better, faster, richer Web experience. Instead of leaving each browser maker to rely on a combination of its in-house technology and third-party plug-ins for multimedia, HTML5 requires that the browser have built-in methods for audio, video and 2D graphics display. Patent and licensing issues cloud the question of which audio and video formats will achieve universal support, but companies have plenty of motivation to work out those details. In turn, Web site designers and Web app developers won't have to deal with multiple incompatible formats and workarounds in their efforts to create the same user experience in every browser. This is an especially valuable advance for mobile devices, as their browsers today typically have only limited multimedia support. The iPhone’s Safari browser, for example, doesn't handle Adobe Flash — even though Flash is a prime method of delivering video content across platforms and browsers. Check out the full article for more complete explanations of each technology. 1) It’s usually best to stay out of a corner. The corner normally causes “bass loading”, meaning that the low frequencies will be increased causing your kick and floor tom to be louder than the other drums. This can also lead to increased ringing and snare buzzing. That being said, don’t rule the corner out without trying it first since the extra fullness of the kick might be just the thing you’re looking for. 2) Find the place in the room with a nice even reverb decay. Pro engineers will usually test a room by walking around and clapping their hands. If the clap has a “boing” to it (a funny overtone), then so will your drums so it’s best to try another place in the room. 3) Ideally, you don’t want to be too close to a wall. The reflections (or absorption if the wall is soft) can change the sound of the kit. The middle of the room usually works best. 4) Ideally, you want the place in the room with the ceiling height is the highest. If the ceiling is vaulted, try placing your drums or acoustic instrument in the middle of the vault first, then move as needed. 5) Whatever you do, stay away from glass if you can. Glass will give you the most unwanted reflections of just about any material. If you have no choice because of the way the room or the band is situated, try setting up the kit at a 45° angle to the glass. A a new study in the UK has found that Brits who illegally download music from the internet also spend more money on music than anyone else. The survey found that those who admit to illegally downloading music spent an average of $125 a year on music – that's $54 more than those who claim that they never download music dishonestly. The poll, which surveyed 1,000 16- to 50-year-olds with internet access, found that one in 10 people admit to downloading music illegally, which music industry figures dispute. The poll suggested the Government's plan to disconnect illegal downloaders if they ignore official warning letters could deter people from internet piracy, with 61 per cent of illegal downloaders surveyed admitting they would be put off downloading music illegally by the threat of having their internet service cut off for a month. But cutting off Internet access to file-sharers could be counter-productive if selling them music is a goal. "The people who file-share are the ones who are interested in music," said Mark Mulligan of Forrester Research. "They use file-sharing as a discovery mechanism. We have a generation of young people who don't have any concept of music as a paid-for commodity," he continued. "You need to have it at a price point you won't notice." The Digital Economy Bill, which will become law in the UK next April, provides new measures to crack down on internet piracy but has generated plenty of criticism from internet service providers, who say it will be difficult to enforce. It's interesting that artists are also divided over the issue, with Lily Allen and James Blunt recently supporting the Government's stance, while the Latin pop star Shakira argues that illegal file sharing brings her closer to her fans. With other studies stating that file sharing as a whole is declining, and predicting that it's demise should music subscription finally become widely accepted, the whole issue could become moot before the bill's effect takes hold. and sage advice from people way smarter than me. I'm looking forward to another year of posts and I hope you are too. There are so many things to think about when you're mixing that it's pretty easy to focus on just a few items and overlook something that could be a lot important to the final product. Add to that the fact that so many mixers do it by feel and don't really have a strict mix routine, and you can see that it's really pretty easy to get a mix that's pretty much of the way there, but it never goes beyond a certain point. To help you get the best final mix possible, here's a a list of the most important items to remember when you're mixing. Does your mix have contrast? Does it build as the song goes along? Are different instruments, sounds or lines added in different sections? 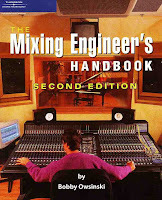 Does your mix have a focal point? Is the mix built around the instrument or vocal that’s the most important? Does your mix sound noisy? Have you deleted any count-offs, guitar amps noises, bad edits, and breaths that stand out? Does your mix lack clarity or punch? Can you distinguish every instrument? Does the rhythm section sound great by itself? Does your mix sound distant? Try using less reverb and effects. Can your hear every lyric? Every word must be heard. Can your hear every note being played? Automate to hear every note. Are the sounds dull or uninteresting? Are you using generic synth patches or predictable guitar or keyboard sounds? Does the song groove? Does it feel as good as your favorite song? Is the instrument that supplies the groove loud enough? What’s the direction of the song? Should it be close and intimate or big and loud? Are you compressing too much? Does the mix feel squashed? Is it fatiguing to listen to? Is all the life gone? Are you EQing too much? Is the mix too bright or too big? Are your fades too tight? Does the beginning or ending of the song sound clipped? Did you do alternate mixes? Did you create at least in instrumental-only mix (TV mix)? Did you document the keeper mixes? Are all files properly named? Are you sure which file is the master?